March Madness is a time when some people who would never otherwise care about sports, let alone invest any time or money in it, will get involved in office pools. Whether it’s because of competition or just to add to team camaraderie, seem to grow in popularity every year. In fact, Challenger, Gray & Christmas concluded that the private sector lost $1.8-billion during March Madness in 2010 alone. Running a pool can be a challenge for several reasons, but an NCAA office pool worksheet is now available to do most of the work for you. Filling out a bracket sheet prior to the start of the NCAA men’s basketball tournament is an annual tradition for many Americans. It was estimated that about 50-million people participated in a March Madness office pool during the tournament in 2012. In fact, an MSN survey revealed that 86 percent of all employees devoted some time during their workday to following the tournament in ’12. In addition, 58 percent of all Americans entered at least one office pool. Meanwhile, a study by “OfficeTeam” concluded that 57 percent of employers encouraged or condoned March Madness office pool activity, and 41 percent of employers believed the “Big Dance” had a positive impact in the workplace. 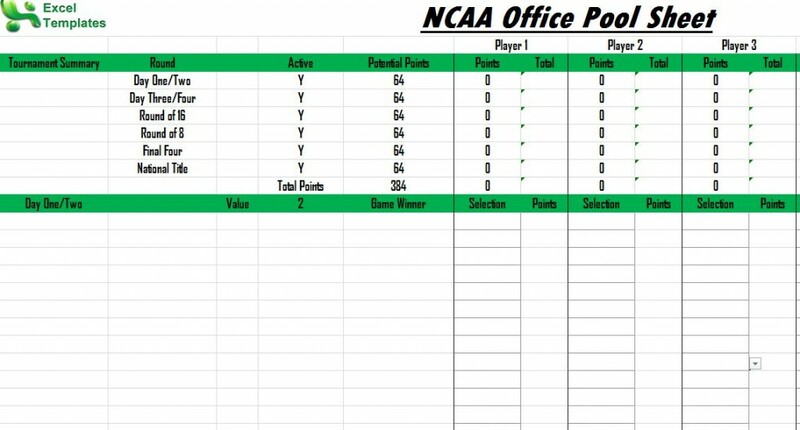 With so many American workers taking part in a March Madness office pool, the person in charge of the contest could spend hours updating the results and standings. However, the new office pool worksheet will take care of all the hard work. All the person in charge of the pool needs to do is determine the points system, add the schools, games and pool participants and then allow the worksheet to do the rest. The points and standings will update automatically upon the conclusion of games, making the Madness a lot less stressful for everyone.